The presence of cane trash markedly reduced the runoff loss of PSII herbicides by almost half soon after herbicide application. The knockdown herbicides tested had a lower risk of runoff loss compared to PSII herbicides. Industry changes in management practices (trash retention and moving to knockdown products) reduce herbicide runoff. Weeds are a major contributing factor to losses in both production and profits for the sugarcane industry. Under favourable conditions, they compete with the sugarcane for vital nutrients and access to water. Minimum tillage and green cane trash blanketing is considered best practice management in cane. Herbicides are used to control weeds; however, there are concerns about chemicals including herbicides being transported to the Great Barrier Reef. The photosystem inhibiting (PSII) residual herbicides are of greatest concern due to their potential to affect algae, seagrasses and coral. provide herbicide runoff loss data to enhance predictive modelling of the effectiveness of improved management practices. Two herbicide mixtures were applied over ratoon cane, with and without green trash blanket, in two field replications. Herbicides were applied at medium to high label rates post harvest onto both cane trash and the soil surface four days after trash removal by hand. Five days after herbicide application each plot (1.7 metres long by one metre wide centred over the cane row) received simulated rainfall (average 77 millimetres per hour) until runoff commenced and then for a further 30 minutes. Samples were collected during the runoff event to determine the runoff rate and the herbicide concentration in the runoff. The table below shows the application rate (kilograms/hectare of active ingredient) of experimental herbicide mixtures applied to cane trash and directly to the soil five days prior to the simulated rainfall. PSII herbicide products are red. Knockdown herbicides are blue. Emerging herbicides are black. Collecting samples during a rainfall simulation. 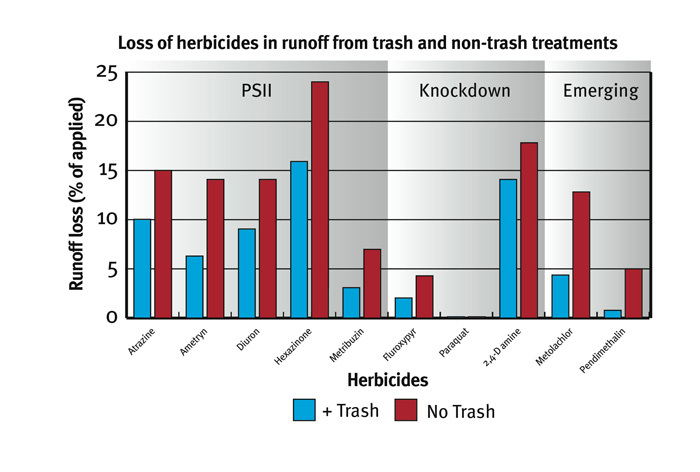 Graph showing loss of herbicides in runoff from trash and non-trash treatments. 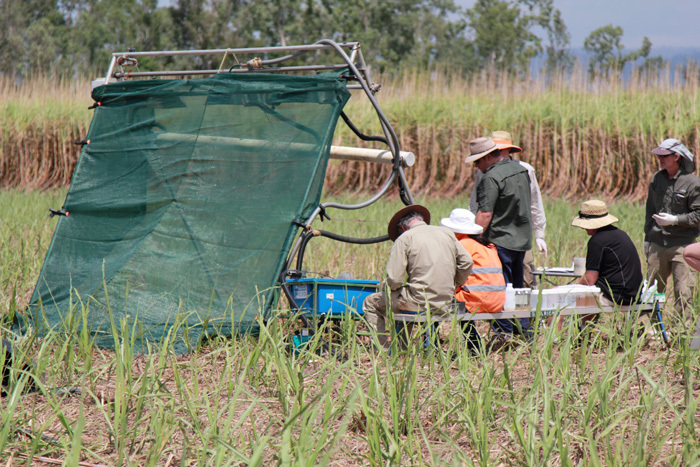 The presence of a cane trash blanket reduced the runoff loss of PSII herbicides by 43 per cent on average, reducing the average runoff loss of the applied active ingredient from 15 per cent to 9 per cent. The runoff loss of the various PSII herbicides ranged from 3 per cent to 24 per cent. The presence of the trash blanket reduced the runoff loss of knockdown herbicides by 24 per cent on average reducing the average runoff loss of the applied active ingredient from 7 per cent to 5 per cent. The runoff loss of the various knockdown herbicides ranged from 0 per cent to 18 per cent. The presence of the trash blanket reduced the runoff loss of emerging herbicides by 74 per cent on average, reducing the average runoff loss of the applied active ingredient from 9 per cent to 3 per cent. The runoff loss of the various emerging herbicides ranged from 1 per cent to 13 per cent. Bruce Cowie, Melanie Shaw, Luke Davison and Wendy Tang (Queensland Government Department of Natural Resources and Mines); Lawrence Di Bella and Ash Benson (Herbert Cane Productivity Services Ltd); Michael Nash (Terrain Natural Resource Management).